This is how arcade-nostalgia compilations should be done. One year after Ultra Street Fighter II‘s pricey-and-thin cash-in on the Switch, the series’ best arcade entries return in a giant, priced-right anthology for pretty much every major gaming platform—and so far, it’s absolutely held up to my series-obsessed button mashing. Street Fighter: 30th Anniversary Collection does right by one of the more enduring legacies of the arcade era, responsible in good part for the popularity of the fighting game genre. Although not nearly as popular as the sequel that would follow, the original Street Fighter came out just over 30 years ago, complete with pressure-sensitive pads (which were switched to the familiar 6 button layout after people injured their hands from hitting the controls too hard). This new collection features 12 games, from the original Street Fighter (1987) up to Street Fighter III: Third Strike (1999). That number is padded a little by the various releases of Street Fighter II, or early game renditions that were surpassed by later versions such as Street Fighter Alpha 1, or Street Fighter III: New Generation, but completionists will appreciate their inclusion. The remaining titles are excellent games that still hold up very well from a gameplay perspective. Each title is accompanied by a history of the game, detailing the original release date, hardware, trivia, and even secret codes to unlock extra characters or features. A Museum mode contains galleries full of original sketches and concept art, an interactive timeline, bios for all of the game’s characters, and a jukebox where you can play back all of the game soundtracks. The interface is simple but gets the job done, and load times for the games and features are nearly instantaneous. It’s easy to jump from game to game, making exploration pretty effortless. The pause menu is available at any time, letting you switch games or characters, pull up nicely formatted special move info, or change your display options. Let’s dive into all of the gameplay and options spread across 12 arcade titles. Versus mode allows you to jump straight into two-player character selection and choose your stage, something you couldn’t do in the arcade. The four titles that are available with training mode. These, coincidentally, are the only ones that work online, as well. The special moves are laid out clearly for easy look up during practice sessions; you can only review the moves for a given fight’s combatants. Training mode options for setting the dummy actions, including whether or how meters deplete. Something’s missing from the control-customization menu: you can’t map three buttons (all punches, all kicks) to a single button, which is handy for some special moves (and helps with gamepad comfort). The rest of the control options in the game’s PC version. Sakura vs Guy in Alpha 2. Note that Guy is from the classic beam ’em up Final Fight, and his compatriot Haggar in the background. One of the most classic arcade intro screens of all time! This big, bouncing sprite of Ryu from Super Turbo was a popular sight at the arcade. Hyper Fighting Ken mirror match. 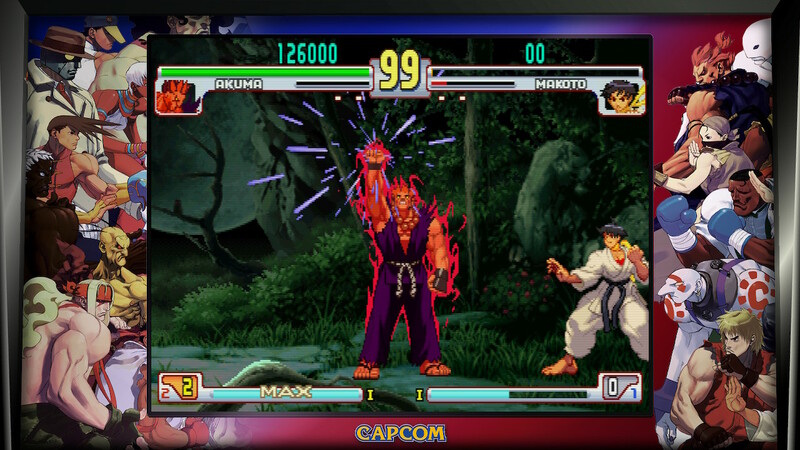 Yun vs. Dudley in the rain from Second Impact. Yun vs Dudley with the sun shining in Second Impact, an example of how the stages could change between rounds. Second Impact shipped with an optional widescreen toggle. This is not being horribly stretched; it’s native! For comparison’s sake, Street Fighter III: Third Strike looks weirder when its 4:3 image is stretched to a 16:9 widescreen ratio. These are the four games you can play online. This lobby system works pretty swimmingly, especially when it lets players vote for which of the available games will be up next. Each game supports one save-state slot. Better than nothing, but we’d have liked the ability to save a few arcade-progress moments. Each available game comes with a boatload of trivia. This list of command trivia is maybe one eighth of the whole entry for the first Street Fighter Alpha. Capcom is advertising the games as arcade perfect, and inside they’re obviously running some sort of emulator for the original ROMs. Accuracy appears to be excellent, with funny glitches from the original arcade versions intact. These are not console ports, and they don’t have much in the way of extra home features, such as Street Fighter Alpha 3‘s World Tour mode from the PlayStation 2 port. But in a nod to convenient play with friends, there is a Versus mode is available for all 12 games that allows picking Player 1 and Player 2 characters and the stage, bypassing the arcade trappings for a direct fighting experience. There are also two filters you can apply to bring back some of the feel of the original CRT screens these games were designed for. The TV filter adds a subtle scanline effect, softening the pixel edges some, while not making the picture appreciably darker. The Arcade filter leaves off the scanlines and instead adds a shadow mask effect, simulating the RGB phosphors of an arcade monitor. It’s a little more pronounced than the scanlines, and it softens the pixelation more, but this option may be too intrusive for those who aren’t used to the look of a CRT. GIF of how Street Fighter 30th Anniversary’s filters look in comparison. “TV” filter, “full” screen size. “Arcade” filter, “full” screen size. No filter, “full” screen size. No filter, original-pixel screen size. No filter, “wide” screen size (meaning, the original 4:3 image is stretched to a 16:9 ratio). The real extra draws outside of a convenient and legal way to play all of the old games on PC or modern consoles are the online and training modes. Only four of the games support online play with training options: Hyper Fighting, Super Turbo, Alpha 3, and Third Strike. Each support standard ranked play, with a leaderboard, and casual matches, but the standout feature is the lobby system. When you set up a lobby you can choose which of the four titles you want selected, from all to one, and within every match both players pick which title they’d like to play. If there’s a conflict, one is randomly picked. It’s a blast to jump from one game to the next, playing a variety of characters and styles in one online session. This feature really brings back the arcade experience of easily walking with your quarter to the next game. It’s still too early to make a real call on the quality of the online play, but initial impressions are mixed. It can be hit or miss—one time you get a smooth experience, the next it’s something more stuttering. There’s no way to set connection preferences, so you’re at the mercy of the game’s matching system. The netcode does appear to be using a rollback system (this is a good thing, read here to understand more) but there are some concerns that the implementation may have unnecessary frame dropping. Launch day is always a tricky time to evaluate netcode, but keep expectations in check. When it works well it feels great, when it stutters it can be frustrating. When picking a platform to purchase, keep in mind the online play is not cross-platform, and your player pool will vary as such. PlayStation 4 is the only console with Street Fighter V, which will likely be the tournament standard, so it will probably have the largest player base. Switch will be hard to beat for convenience, but don’t count on any of your opponents moving beyond Wi-Fi since you can’t use Ethernet without an adapter. Choose wisely!